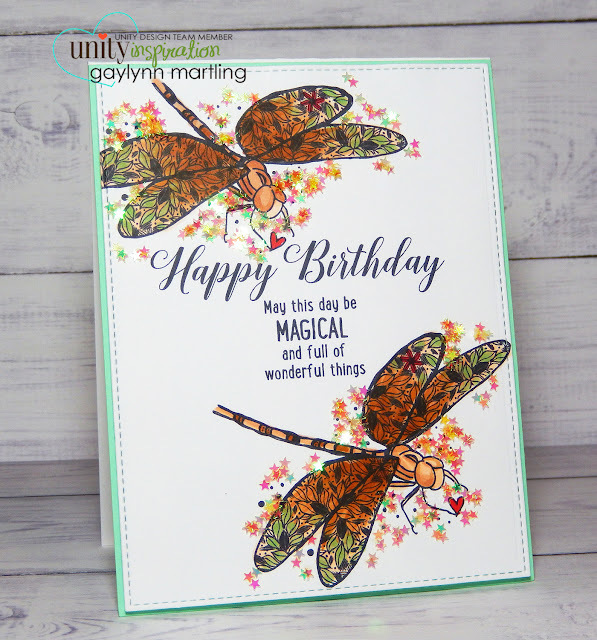 Today, I am up on the Unity blog with these dragonflies. Sentiment: Happy Birthday. May this day be magical and full of wonderful things. I am forever in need of birthday cards to send out. This one has tiny iridescent glitter stars for a magical look. Check out this quick tip video tutorial for it. Supplies: Unity Stamp Co. Kit of the Month When You Smile and Special Wishes, My Favorite Things dies, Copic markers and star glitter. 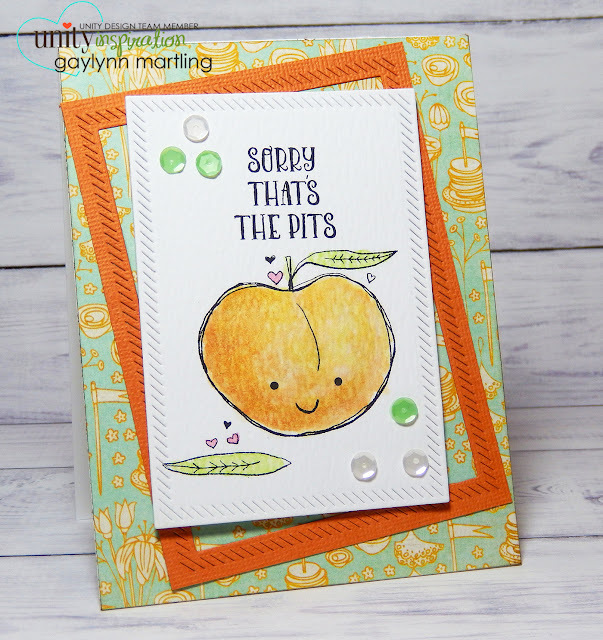 This one is an adorable peach pun card. I don't use puns all that much, but couldn't resist making something with this cutie. Sentiment: Sorry that's the pits. For this peach, I used water soluble oil pastels. These pastels have a softer look to them, perfect for this peach. I made a frame with die-cuts and left the frame open on the inside, like a pit, haha. I did a quick tip video tutorial for it. Supplies: Unity Stamp Co. The Pits, My Favorite Things dies, Pretty Pink Posh sequins, Ranger watercolor paper, paint brush and Prima water soluble oil pastels. Here is a watercolor technique with a vintage style. Sentiment: I don't always say thank you, but when I do it's because they deserve it. This is full of humor and fun, made to bring laughs. It incorporates layers of watercolor in Brusho powders. I really like how vintage it turned out. Just what I was hoping for. Here is a quick tip video tutorial for it. Supplies: Unity stamps from Not Always...But; Brusho Crystal Colours powder; Ranger distress ink, archival ink & watercolor paper; dies by My Creative Time and My Favorite Things. Here is a love themed feather card in boho style. Sentiment: Love makes the wildest spirit tame & the tamest spirit wild. I love the whimsical feathers hanging. They are painted in with watercolor. A quick tip video tutorial follows. Supplies: Unity Wild Heart, Sakura Koi Watercolors, Ranger Archival ink, My Creative Time dies, paint brush and Ranger watercolor paper. 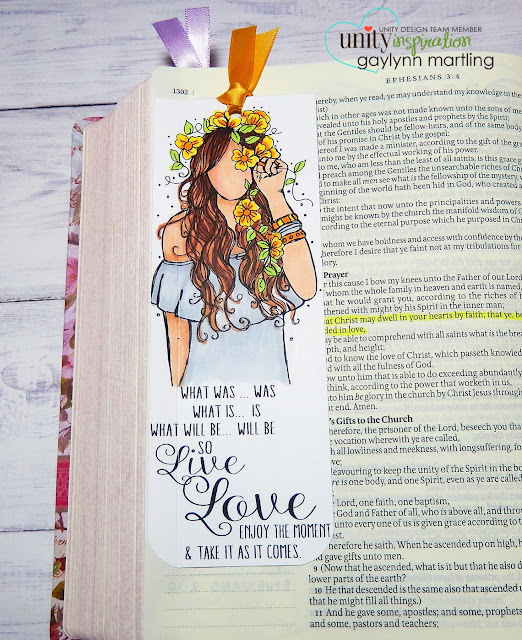 Here is a way to add art coloring like Copic Markers with bible journaling. Sentiment: What was.. was. What is.. is. What will be.. will be. So live, love and enjoy the moment & take it as it comes. I wanted to incorporating bold coloring and stamping, but wanted to preserve the thin bible pages. Here is an easy way to make a tab for when you do not want ink or markers to bleed through to the back side of the bible page. I have more bible journal posts sharing different techniques and tips crafting with the thin bible pages. I made a quick tip video tutorial with this girl. If you would like to see a particular crafty technique here, please mention it in the comments. Supplies: Unity What Will Be Will Be, My Creative Bible, Copic markers, paper trimmer, scoring board, double-sided tape and ribbon. 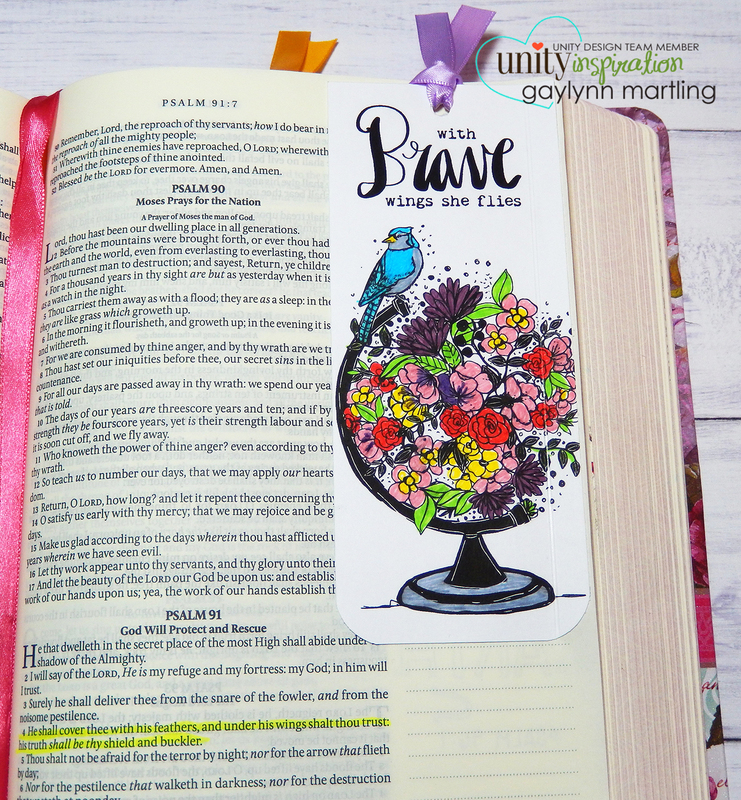 Here is a bible journal page with a way to add an art tab and still be able to read the bible text. Sentiment: With brave wings she flies. Sometimes, markers and ink used in art and stamping can bleed through to the back of bible pages. Here is a simple way to make a folding art or journal panel tab to add to your page. I have a few other bible journal posts trying out different techniques and products with the thin bible pages. There are products and techniques which are easier on the thin pages. But, for times when those are not on hand, this is another way to make the pages pretty or even to add space for your own bible journaling. For my bible journal posts here, I share the art aspect and keep my personal journal writing to myself. Here is a quick tip video tutorial for this project. Supplies: Unity Radiate the World, My Creative Bible, Staedtler Triplus Fineliner pens, cardstock, ribbon, double-sided tape, paper trimmer and scoring board. I hope this inspires you to try out something new, fun and pretty for your bible pages. This otter couldn't be any cuter. This is perfect for loved ones, Valentine, birthday or thinking of you. If the otter isn't enough on its own, the embossed background adds even more artsy love in XO and hearts. The background is heat embossed and shines with the light. I have a quick tip video tutorial for this otter project. Supplies: Unity You Otter Be by Tierra Jackson and Vibes by Jolande & Marleen, ColorBox ink, Ranger embossing powder, Misti, My Creative Time dies and Copic markers. It is that time of year for love and Valentine cards and gifts. Sentiment: Will you be mine? This is one of the newest Phyllis Harris girls and she is the sweetest. I love her little balloon and her expression. So sweet. Here is a quick tip video tutorial for this stencil project. 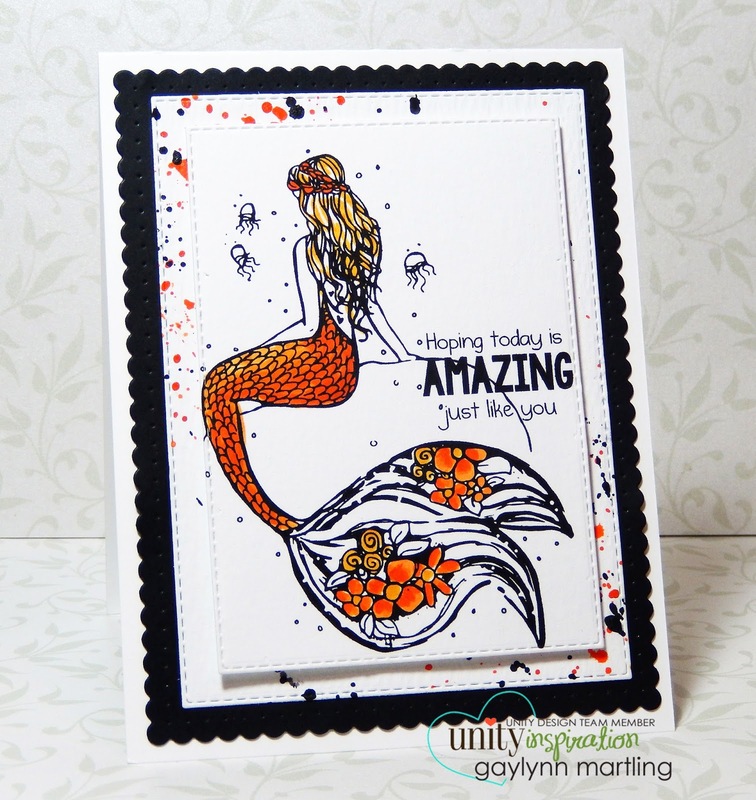 Supplies: Unity Will You Be Mine by Phyllis Harris, dies by My Creative Time and My Favorite Things, Copic markers, Tim Holtz distress ink pad, ink blending tool, BoBunny doily, stencil, punch and twine. I hope this brings you smiles. Here is an inspirational card for encouragement, great for many occasions. Sentiment: Be you bravely & flourish. This girl is in watercolor and sparkles with glitter accents. I love the crown of flowers and the inspirational message. This is layered with the look of stitching. It would be a great card to encourage or lift someone's spirits. I made a quick tip video tutorial with her. Supplies: Unity Stamp Co. Bravely Flourish, My Creative Time dies, Canson watercolor paper, Tim Holtz distess markers, water brush, glitter, Glossy Accents, Ranger Archival ink. Here is a heartfelt sympathy card with a little sparkle. Sentiment: In memory and celebration of someone special. The image is in the shape of a heart. I used watercolor and shimmer accents. Sympathy cards are the most difficult to make, especially when that time comes. Having cards like this handy helps. This set has amazing and fitting sentiments. Supplies: Unity Stamp Co. May Strength Surround You, dies by My Creative Time, Spellbinders and My Favorite Things, Canson watercolor paper, Tim Holtz distress markers, Wink of Stella Clear, water brush and Ranger archival ink. If there is a crafty technique that you would like me to share in a tutorial, tell me in the comments. Here is another Autumn themed card which I haven't posted until now. Sentiment: Fall in love with as many things as possible. I love the sentiment with this Fall scene. Supplies: Unity Moments Between Moments, vellum, eyelets, Derwent Inketense watercolor pencils and Canson watercolor paper. 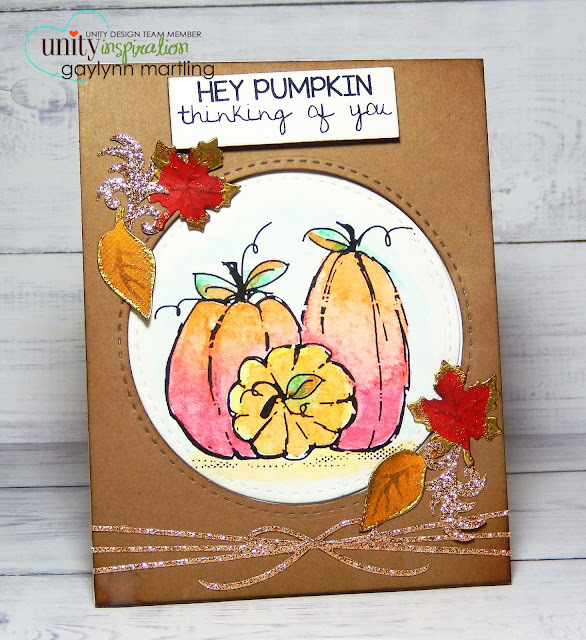 Here is an Autumn themed all occasion card that I made but never shared here. Sentiment: Hey Pumpkin, thinking of you. This one is warm and rustic looking with gold embossed details and accents. The pumpkins are in watercolor and framed. This card can be for Thanksgiving or any Fall occasion. Supplies: Unity stamps from Moments Between Moments and Bountiful Owl, Prima water soluble oil pastels and dies by Lil' Inker Designs, Pretty Pink Posh and Spellbinders. This mermaid is in watercolor with colors that pop. Sentiment: Hoping today is amazing just like you. I used only a few coordinating colors for this card and in just a few places to make the colors pop. The background are watercolor splatters in the same colors. Supplies: Unity stamps from Mystical Mermaid and Succulent Salutations, dies by My Creative Time and Winnie & Walter and Sakura Koi Watercolors.